Wally Bill Hedrick is a legend. 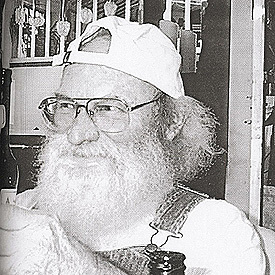 Wally was a mentor, teacher, artist, inventor, musician, art administrator, brewmeister, friend. I first knew of Wally through my cousin, the artist Leo Valledor. Wally was Leo’s friend and close mentor all through Leo’s life. Leo appreciated the encouragement that Wally gave him, which opened the path for Leo to becoming a fine artist. Leo was seventeen when he got a scholarship to California School of Fine Arts [known today as the San Francisco Art Institute]. Wally brought him into the fabled Studio 15 and Leo’s work eventually earned him his first one-person exhibition at the Six Gallery. When Leo was facing the dilemma of having to quit school, Wally advised him that there was no one at the school to teach him what he needed to know and that he (Leo) had what was needed to be a good painter. Leo always had a special respect for Wally until the end. I met Wally at a California School of Fine Arts Halloween Party in 1953. He was playing banjo with what was the beginning of the Studio 13 Jass Band. I think of that instant—the party, the music, the people—as something that I needed, and aspired to being around. After I was separated from the army I enrolled in the school with my GI Bill funds. Since Wally passed I have been thinking about what he meant to me and what he turned me onto. He was always a very modest-bigger-than life presence. The model for me was the way that he had seamlessly engineered his life and art at the time from 1958 through 1960. Whether he was mentoring and teaching, being an arts administrator, doing art, tinkering with electrical or machine parts, making music, partying, or being a friend for me watching his process was as dazzling as it was informative. All of his time was enmeshed in creativity and specific importance. He was a chief organizer of the Six Gallery, a cooperative gallery which to my knowledge was the first nonprofit exhibiting space in San Francisco. Besides being an alternative to the mainstream painting and sculpture exhibitions that the S.F Art Association presented, the Six presented music concerts and poetry readings. Ginsberg’s “HOWL” was first presented there in the late 1950’s. I remember Manuel Neri complaining that the poets bashed in the piano after that reading. Artists that showed there included James Weeks, Manuel Neri, Bruce McGaw, Fred Martin and Jay De Feo, to mention a few. Wally and Jay’s house on Fillmore was the unofficial first stop on the art itinerary of anyone important in the art world, national or international. Their house had a doorway opening into Bill and Joan Brown’s house. There was a maze of studios and apartments with great work in all of the studios: Wally’s studio looked like a tinkerer’s workshop, Jay was working on a series of paintings, (Veronica and Death Rose), Joan was working on large drawings, Bill was working on some beautiful figurative pieces. The Studio 13 Jass Band was first started by Charlie, the clarinet player, but after Wally joined he became a vital catalyst. The roster of musicians was very impressive: Charlie (clarinet), Elmer Bischoff and Bill Brown (trumpet and cornet), Jon Sagen (valve and slide trombone), David Parks (piano), Frosty Myers/Dave Getz/Walter De Maria/Mike Henderson (drums), Richard Shaw (tuba), Mike Fender (bass). To the many other musicians who came and went who I did not know—please forgive me. As I remember, one of the conversations that we had was about the way Wally tuned his banjo. He admired Freddy Green, a rhythm guitar player who played with the then-famous Count Basie Band. Wally said that he tuned his banjo like a guitar and strummed rhythms inspired by Freddy. When Wally made home brew beer it was nothing else that I had ever tasted, strong, like ale, and the alcohol content was around 12 or 14 percent as opposed to the 3.2 percent that was readily available in stores. When Jay De Feo stretched and restretched her Death Rose painting [now known as The Rose] there were at least twenty of us holding a part of the canvas while Wally secured it with a staplegun. We all were so loaded it is a wonder that the painting got mounted. I cannot remember all of the holidays that we celebrated because of the potency of that brew. Later, after Wally got tired of making home brew, there was a cheap beer that we all chipped in for—“Brown Derby” beer. We did a lot of beach parties at that time. Wally did not leave any of the cans; he recycled them all in his work. Some of his most memorable sculpture from crushing and welding the cans together, or stacking and welding them. Wally’s sculpture was always unique and personal. The bond between his life and his art was the force of an aesthetic colored with wry humor. His titles always had puns. In 1956 he made first light sculpture that I had ever seen. There was a bar on Upper Grant called The Scene; above the bar was his work, a fixture that responded to sound. Later on he had the piece on at his house during a Christmas celebration for which Wally put on some Miles and Coltrane on and the sculpture went crazy! I also remember his assemblage Xmas Tree Sculpture, that lit up and danced! When Wally was the Night Registrar at the school [CSFA, now SFAI] the school took on another life because of all the night classes available. He was always into something. Besides holding forth, he was involved in an art process in which he used the mimeograph machine as a word processor to make poetry. I remember that we all were very proud of both Wally and Jay when they were chosen for the ( I think it was) “16 Americans” show at the Museum of Modern Art in New York. The curator was Dorothy Miller. This was momentous because no one from the West Coast was ever selected for anything during that time. The other artists that were chosen included Frank Stella and Ellsworth Kelly. After that show Wally bought an Austin Healey! Wow! There was an aesthetic judgment prevalent in the San Francisco art scene at the time that favored “serious” art over “decorative” work. Wally took “decorative” curly-cue motifs and made an image that was very serious. He never played it safe. He was always socially and politically conscious. Before he moved to Marin he did some controversial, conceptual art work which was some of the toughest painting that I had seen. He was against the Vietnam War and hated Madam Nhu and all the politics that she stood for. He made some tall large canvases that he painted thick black and constructed a room with them. There was also a series of work that decried and protested the war. Part of his outcry was his notice to his students that he would not teach as part of his protest. Wally lost his job over this, but he was never afraid to say what he felt. All of these recollections are part of my memory of the many ways in which Wally was my model for seamlessly multi-tasking as an artist and individual. I remember all of the good that he did, the art that he made, and also some great times shared together. — Carlos Villa is a noted artist and educator who has himself mentored several generations of students.